Flies on stilts! Because sometimes even tiny flies need to big themselves up. 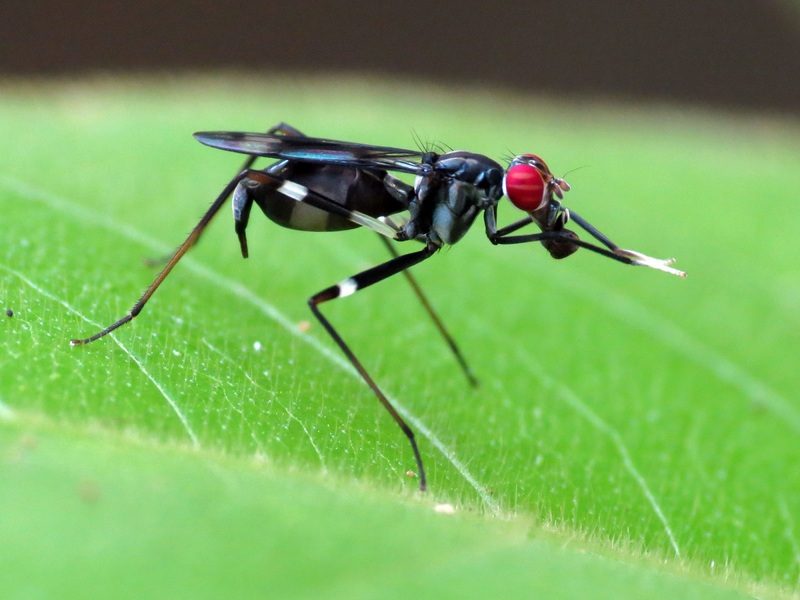 About 500 species of Stilt-legged Fly make up the Micropezidae family, ranging between a minute 3 mm (0.1 in) and an impressive 2 cm (0.8 in) in length. They're found all over the world, though there are more in South and Central America than anywhere else. Also there are none at all in New Zealand. New Zealand is so distant from other land masses that all sorts of unexpected creatures grow or shrink to inhabit ecological niches that in other lands are filled by more familiar animals. I wonder what fills the gap left by Stilt-legged Flies? Micropezids look like supermodels. EXACTLY like supermodels. It's because of those long, slender legs, long, slender body and big eyes bulging out of a tiny head. It's like a miniature, less grumpy version of heroin chic. 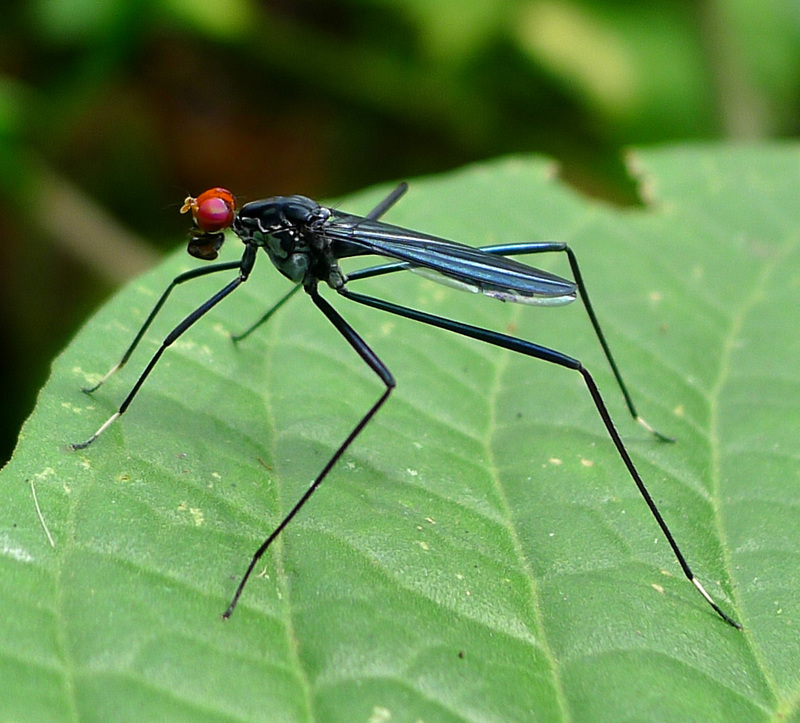 Stilt-legged Flies have six long legs. Actually, that's not quite true. They have two long legs. The rest are incredibly long legs of preternatural length. How's the air up there? Do you play basketball? The air up here is a fetid stench that blackens my lungs, curdles my blood and makes me feel drowsy all the time. And no, I don't play basketball because the air up here is a fetid stench that blackens my lungs, curdles my blood and makes me feel drowsy all the time. 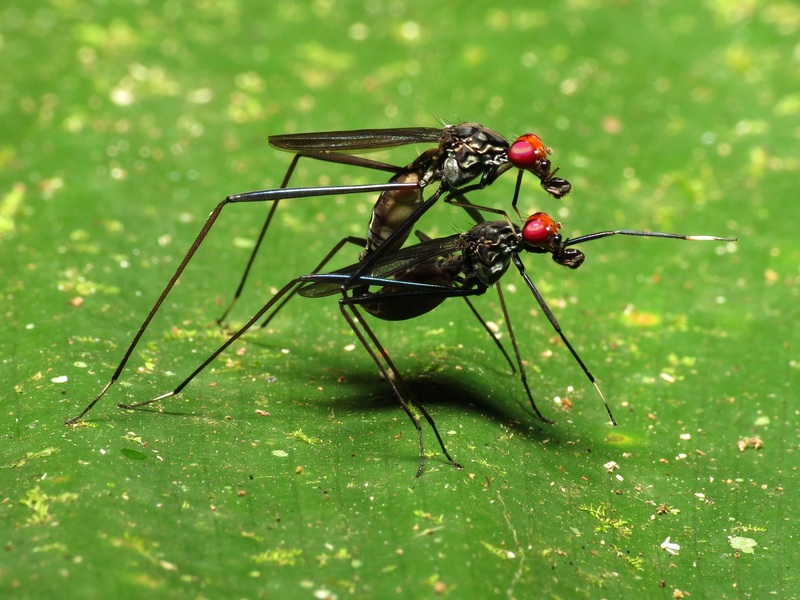 Stilt-legged Flies just love to get their groove on. Even in the throes of passion. The point of these smooth moves, aside from the sheer pleasure of movement and mastery of one's own body, is mimicry. 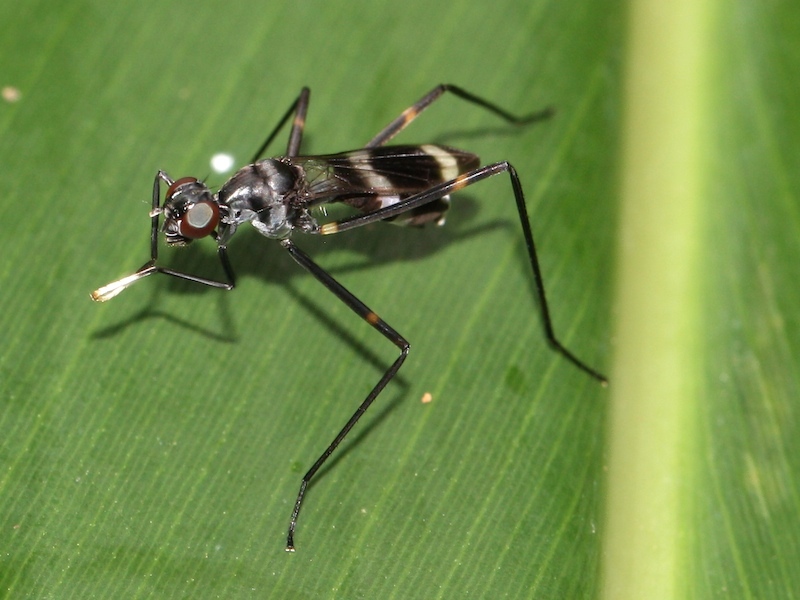 These flies are essentially defenceless, so many of them wave their front legs around to mimic the antennae of wasps. 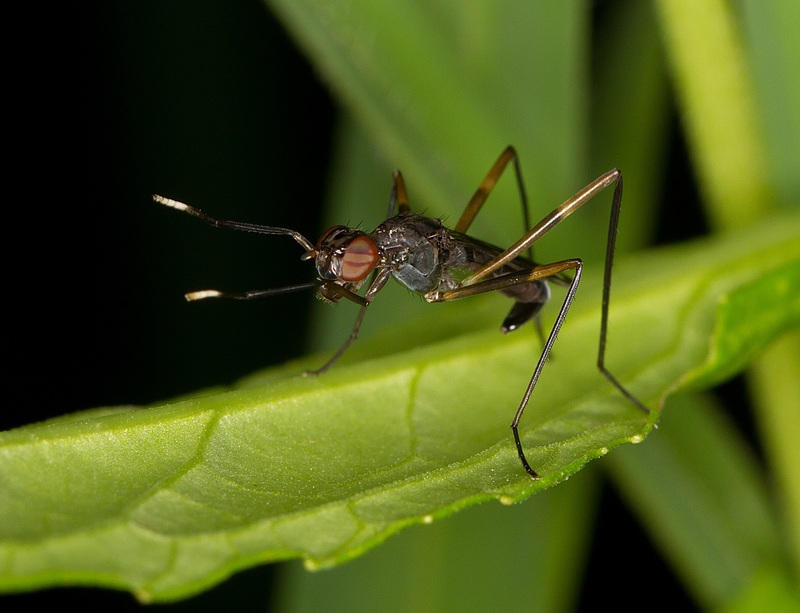 Other Stilt-legged Flies mimic ants. One such mimic even went to the extent of losing its wings! That's some good undercover work. It's a species called Badisis ambulans, which is found in just a tiny part of south-western Australia. 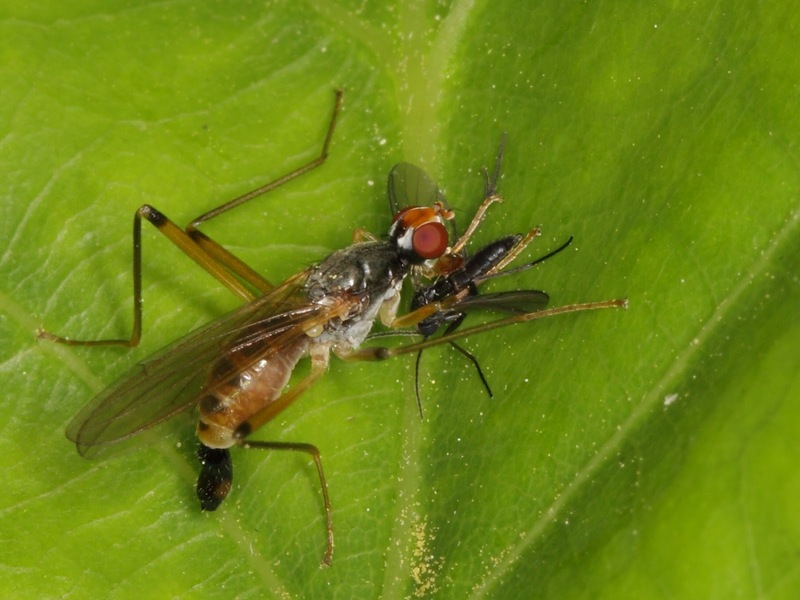 The reason for this minute range is that the larvae of this particular fly live in the pitchers of the Albany Pitcher Plant, which are endemic to that one, small part of the world. 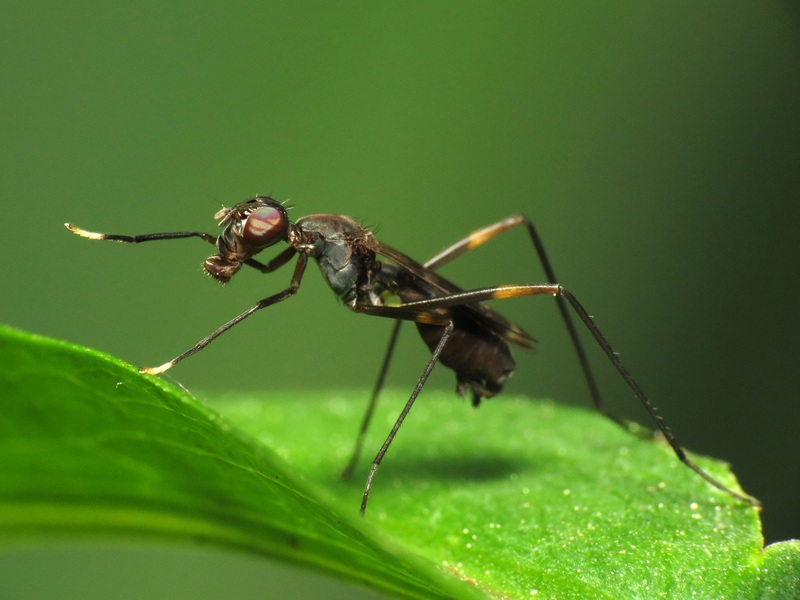 Little is known about the larvae of other Stilt-legged Flies. It's thought they probably live in various kinds of rot and decay, maybe feeding on fungus, fine plant roots and rotting vegetation. As for the adults, some of them prey on small insects. Others are attracted to the sweet stench of rotting fruit or fresh dollops of faeces. Clambering around on that stuff, those stilt-legs suddenly make perfect sense! I'd think the legs would come in handy keeping the bulk of the fly away from all of the billions of hideous spiders! Ah! So many uses for uncompromising legs! The grooming is ridiculous! Every nook and cranny is tended to! Talk about extreme living for the Badisis ambulans species. Living in the bowels of a carnivorous plant must be hard. I know! But if you can survive all the digesting stuff then I guess it's a big bath of food.